appox. 240 - 300 g per paint coat per m², depending on layer thickness. For an exact calculation we recommend a trial coating. The drying time depends on surrounding temperature and air humidity. Remark: test compatibility with existing old paintings by a sample coating. Depending on method of application there may occur colour differences. Suitable grounds are bearing, dry, rust-free and clean surfaces, which are free from releasing substances. We recommend to consider the VOB, part C, DIN 18363. 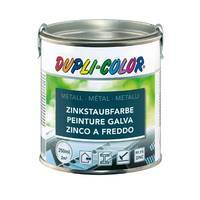 Zinc Powder Paint is adjusted brushable. Before use, carefully stir up. In order to achieve the high layer thickness, apply undiluted. Optimal layer thickness will be achieved by brushing. Hand-derusted areas 3 x, all other surfaces should be coated 2 x. Minimum layer thickness 80 µm per layer if undiluted.